Duchess Kate: William and Kate Hold Hands for Christmas Day Service with the Royals and Middletons! The Duke and Duchess of Cambridge joined the Royal family for the annual Christmas Day service at St Mary Magdalene Church. Every year at Christmas around thirty members of the Royal family arrive at Her Majesty's Norfolk estate, Sandringham, including Prince Charles and the Duchess of Cornwall, Prince Harry, the Princess Royal and her family, the Wessexes and the Yorks. With varying commitments it's the perfect time for the family to catch up and enjoy the festivities together. This year, William and Kate are primarily celebrating at their ten-bedroom country mansion Anmer Hall with the Middleton family, who arrived last week to spend as much time as possible with Prince George. The Middleton family joined the royals for church this morning. Ashley Marie correctly noted Carole looked stylish in a coat by one of Kate's favourite labels Really Wild Clothing. Yesterday, James Middleton participated in a Christmas Eve football match with Prince Harry (Prince William sat out due to a twisted ankle) and it's thought the Middletons may join the Royal family for the annual Boxing Day shoot, too. As always, locals from the area assembled to see the royals arriving for the service and like last year were hoping for a glimpse of Prince George. The energetic toddler will join his parents when he's older but for now he's most likely enjoying his gifts from Santa back at Anmer Hall. 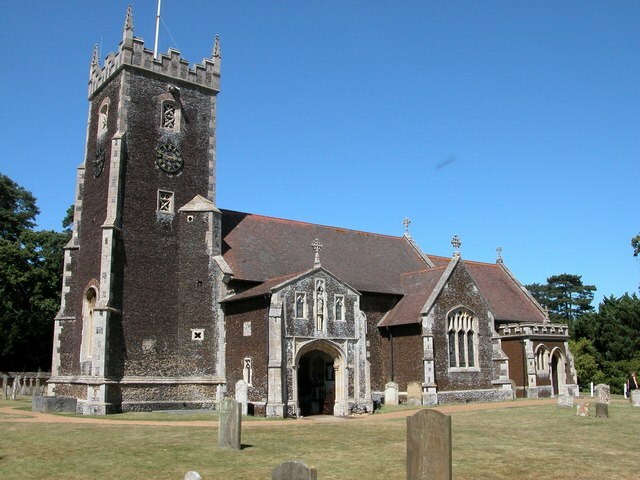 The parish church of St Mary Magdalene is one of exceptional historic interest, with memorials to many members and relations of the Royal family from Queen Victoria onwards. It is considered one of the finest carrstone buildings in existence, and dates back in its present form to the 16th century. 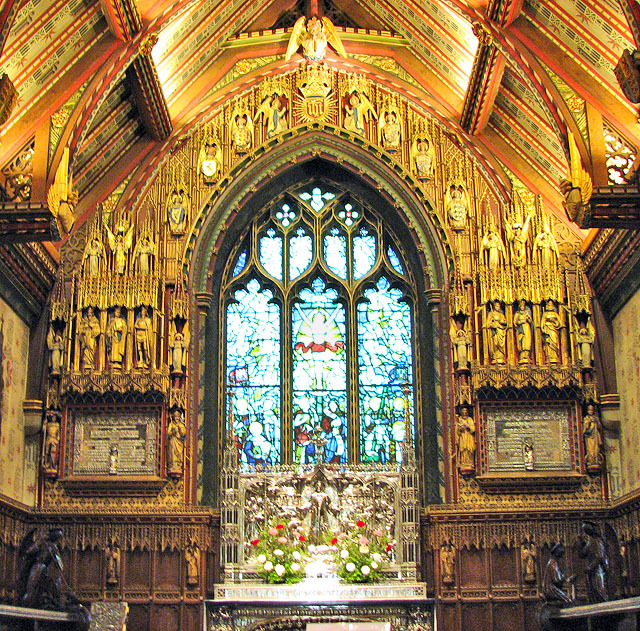 The sumptuously decorated chancel with its carved angels frames the silver altar and reredos presented to Queen Alexandra by the American Rodman Wanamaker as a tribute to King Edward VII. He also presented her with the silver pulpit and a silver 17th-century Spanish processional cross. Other notable features include a Florentine marble font, a Greek 9th-century font and stained glass from the 16th century onwards. As they made their way from church, they chatted with locals and Kate accepted flowers. Kate spoke about the little prince "I'm sorry we didn't bring George but you would have heard him in the Church". Kate with Prince Charles after the service. Her Majesty looked regal in pink. You can view The Queen's Christmas speech at YouTube. This years theme is reconciliation and she pays tribute to Ebola volunteers and the poppy display at The Tower of London. Kate looked festive in a gorgeous new coat. 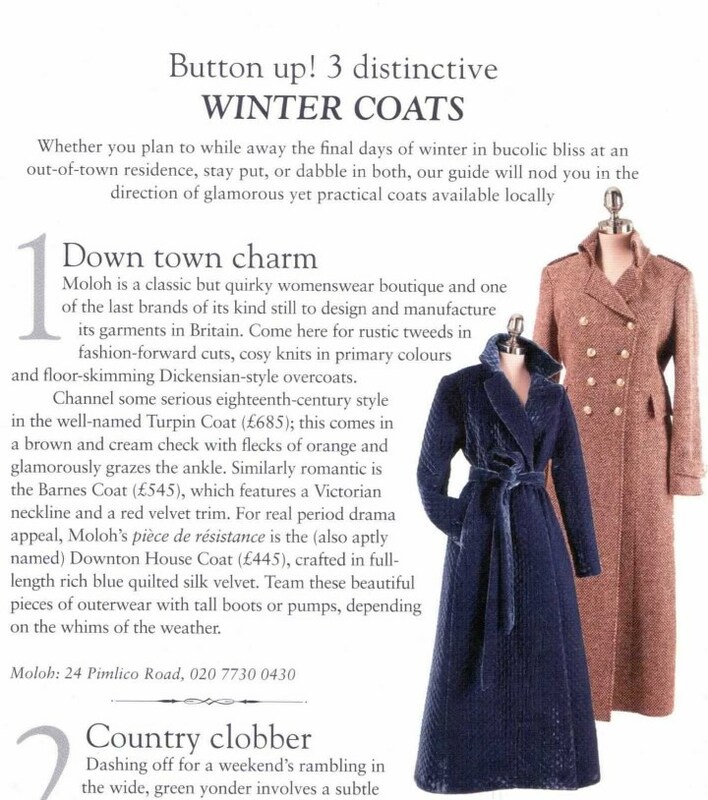 A What Kate Wore reader suggested it is the Moloh Turpin Coat. The £685 eighteenth-century style garment is from the 2013 collection and comes in brown and cream check with flecks of orange. 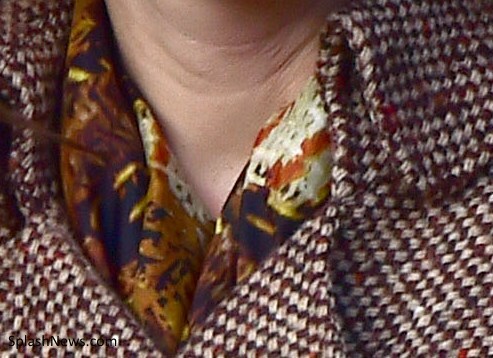 Kate's coat is shorter than the piece shown below but it certainly appears to be the correct one. 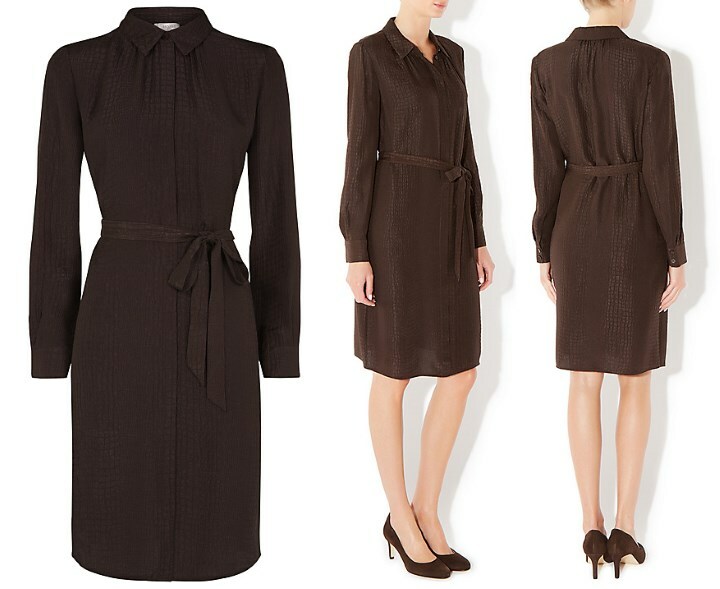 It appears the Duchess wore her Hobbs Brown Animal Shirt Dress. The garment is significantly reduced at John Lewis and House of Fraser at the moment. Kate brought back her popular £245 Lock & Co. 'Betty Boop' hat. The Duchess wore her Emmy Shoes 'Valerie' pumps. 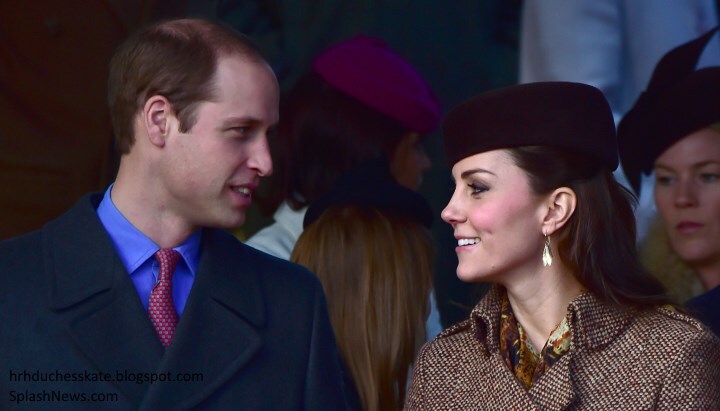 Readers will recognise Kate's pretty Catherine Zoraida Double Leaf earrings from the 2012 royal tour. 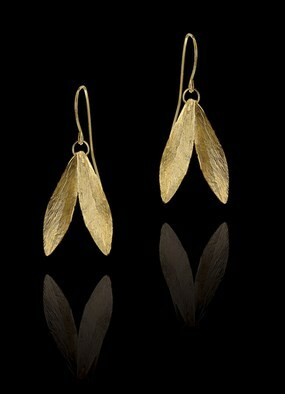 The £140 earrings are made in 18ct gold-plated silver and feature beautifully engraved feather details. Kate completed the look with a new silk scarf. 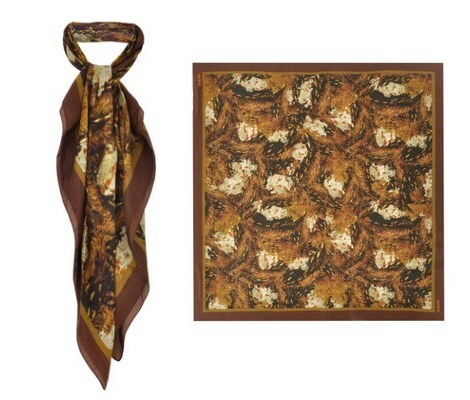 Really Wild Clothing confirmed it is their Silk Scarf in Autumnal Partridge. The £125 piece was designed in-house and inspired by Game birds in warm, Autumnal colours. Also today, we recently discussed William and Kate's Christmas card and what photo it would feature. Thanks to our friend Trisha from A Petite Princess we now know they chose one of Prince George's first birthday portraits. Finally, an interesting snippet of information emerged during the week from the St Andrews University student paper The Saint. As a second year student she was asked why she decided to go to university to which she replied: "To get an overall education in all aspects of life." I'm off for Christmas lunch with my fiancé and family now and expect William and Kate will be shortly enjoying theirs, too. Merry Christmas, Charlotte! I have many things to commend you on: speediness of posting (as usual), the detail, and the photos of inside the church. For such a small church the detail and interior design is stunning; I have never seen photos before! I am surprised it is a new coat, as the style is very reminiscent of coats she used to wear pre-engagement (like the one she wore to one of William's ceremonies that her parents also attended, then post-engagement had shortened). I think this is the first Christmas we have not seen Aquatalia boots at Christmas. In a selfish, not really that important way, I'm a tad sad she didn't debut new jewelry that we could presume is a gift from William ;-) Perhaps the scarf was a gift from someone. As usual, they look in love and connected! So stoked the Middletons were a part of the church service! I don't think it's a particularly festive coat ... Christmas is one occasion where I'd love to see kate in color .. kate looks very happy and very beautiful as always but I just simply couldn't care less about the coat .. Yes I agree. She looks very stylish, but a colorful coat would have been nice! Love her make up and the scarf a lot though !!! Merry Christmas!! Nice to see a good number of the Royal family and the Middleton's on the walk to the church on what looks like a nice sunny and cool day. I love the new coat on Kate today and look forward to finding out the designer. I must say that I think she looks beautiful in rich brown colors. Enjoy the day!! Thanks Rebecca for clarifying that point. I believe they attended the church service though. Sorry. I just am not a fan of the coat or hat-the coat especially I just don't like brown in general on her. The coat looks like something Princess Anne would wear. The plaid dress last Christmas was awesome. But Merry Christmas and thanks for this blog! And here I'm exactly opposite. The coat last year was way too short and looked like a stadium blanket, and the length and colors this year are just, so, well, princess-y! I like her in brown and feel that the coat is rich looking. I liked her look last year too! I really like her in coats and coat dresses. Nice that we all have slightly different takes on her look. Speaking of Princess Anne, her coat was one of my favorites among the royals this year. I liked the red with the black trim - I'd actually like it on Kate with heals and one of her black hats (didn't care for Anne's boots and skirt - the proportions were off for me). Princess Anne isn't known for being a fashion icon, but she is one of the hardest working members of the royal family. That aside, I do think this coat is not one of Kate's more "youthful" options. Kate could recycle this coat when she's Anne's age and it would still look lovely and appropriate (and I wouldn't be surprised if she does). 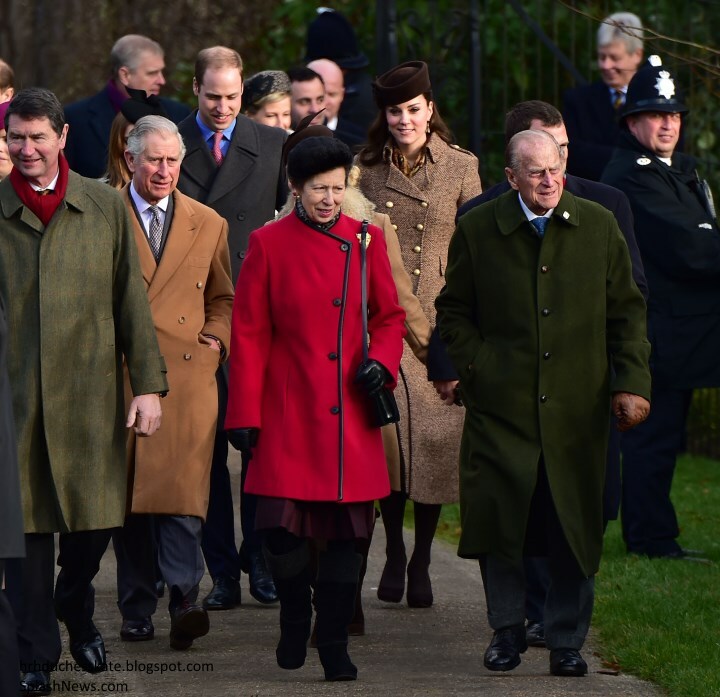 Interesting that Princess Anne and her family walked first with Prince Philip, ahead of Prince Charles and his family. No official protocol there - Prince Philip calls the shots when he is at the head of the clan! I've liked all of Kate's coats for the Christmas walk so far. Think she has chosen a good variety. Thank you Charlotte! Such a lovely way to begin Christmas morning! It truly feels like a special gift. I hope you enjoy your holidays. Cheers everyone. I absolutely LOVE this look from head to toe. This is one of my favorite hats and the overall look is just so classy and sophisticated. And how nice that the Middleton's were included. Talk about progress! Wonderful. Merry Christmas Charlotte and to all your readers!! Kate looked lovely. It´s great to see them so happy together and holding hands. First of all, a very Merry Christmas to you Charlotte and all of your family!!!!! So glad the Middleton family could join them. That church is beautiful, I too would never have expected the inside to be so ornate. I do like Kate's coat but a bolder Christmas color would have been nice. Perhaps she wanted to tone things down so all eyes wouldn't be just on her. Queen Elizabeth looks so happy! I love her smile. Well Have a fantastic Christmas Day to all the 'Duchess Kate' family ! Merry Christmas to you, dear Charlotte, and to all the "Duchess Kate"-fans as well! I love the coat very much; especially as brown is one of my favourite colours when it comes to clothes. To me it appears as a very elegant colour, and in combination with Kate’s brown hair and golden earrings it looks very chic. I have recently seen people wearing colours that resemble their hair colour a lot; in fact Camilla, the Duchess of Cornwall (who I for one really like), does that quite often with shades of white / cream colour. Spending Christmas together must be very pleasant for the Cambridges and the Middletons alike. In the pictures together with James Middleton Harry (who I like even more) once again proves to be a very amiable person. I guess that many people are envious of the Middletons and blame them for the umpteenth time as “social climbers”, so it is doubtlessly helpful that Harry shows his sympathy so obviously. That is Christmas spirit at its very best. I agree, Marion and like all your comments very much. I love her outfit. The colors are gorgeous on her. She looks so happy and glowing. Thank you for sharing details about the church. It's so beautiful and ornate on the inside. I love the pink outfit on the Queen as well, she looks stunning. I had to admit that when this hat first appeared it wasn't my cup of tea...but as times goes on and the more I see it the more i fall in love with it...it has become one of my favorites hats on Kate. It doesn't seem a lot like Christmas. The coat looks like it goes better, with a harvest celebration. Loved her entire look today. Also glad to see she was with the Royal family for this occasion, and that her family stayed in the background. Good compromise. I agree with Rebecca -- Sweden. Kate looks regal and lovely and that church is gorgeous. I love to see them holding hands. Wondering...in the video, who was the short-ish dark haired man who emerged in the last trio (with Harry and Andrew)? I read somewhere that it's the Queens equerry. Kate looks lovely. You could give me that coat for Christmas and I would be very happy although I wouldn't look beautiful like her in it. She is truly glowing and so good with the crowds. I like that length on her. The queen looks splendid in her pink and nice to see almost all of the rest of the family. Thought the queen's choice of subject for her speech so caring and timely -- and no abdication or hint of it!!! Camilla was absent due they say to a back injury. I suspect she saw that the Middletons were to be invited and her back began to ache. Her own family has never been included at least up to now. The Middletons are seen as putting themselves forward unbecomingly -- and this year I must agree as far as Pippa and James go --- and are horribly unpopular but this seemed like a good compromise having them attending but not doing the walk. In Daily Mail, a charming little spaniel named Pippa needs a home. Wish I could bring her home but too many spaniels already. What a sweet name for her and a precious face. I trust she will find a good family to love her. Thank you Charlotte for all your wonderful, beautifully done work and all your thoughtfullnes to your readers. We all are so grateful. (And still hoping for a renewed Royal Digest. You have such brilliant ideas for it.) Thanks to your fiance and family too and a Happy Christmas to all with a special prayor for peace and the best of everything for all readers here -- and strength for all the challenges we face. We may not always agree but we support each other. I am sorry, dear anon, but I must strongly contradict you, but only on behalf of the Duchess of Cornwall. My attitude towards Camilla is very positive. Of course I know about her past, having intruded into someone else’s marriage, which is to be strongly criticized, no doubt about that. But people do make mistakes for a number of reasons. In the end Charles and Camilla decided to get married, they are happy with each other and so are the Queen and also William and Harry. And if they have accepted that decision, I am more than ready to follow them. My impression has always been that it was (and is?) very difficult for Kate to find her place in the Royal Family. She came out of nowhere and immediately took the whole public attention from all the other born Princesses and Princes. Even though I can also see their viewpoint (not half as pretty and without such a loving family in the background like the Middletons), I feel more with Kate. I may be totally mistaken, but I have always realised a strong bond and a certain warmth between Kate and Camilla and no jealousy whatsoever from the older woman’s part. There have been warm-hearted and encouraging smiles and that wonderful bracelet Camilla gave to Kate. So why should Camilla retreat when the Middletons turn up? The Middleton family did not take part in the Sandringham walk to church, but “only” stay in Anmer Hall and attended the Christmas service. They are entitled to both occasions, to visit their daughter’s family and to go to church. Camilla is the second important female Royal member right after the Queen, and if the Middletons were half as eager to position themselves close to the Royal Family, why on earth should they try to get in Camilla’s way? They will no doubt be careful not to cause any distress. Apart from that Carole and Michael appear to be common grandparents who love nothing more but spending Christmas with their children and grandchildren. And that is quite a good idea “methinks”, especially at Christmas. Merry Christmas to you, anon! I agree with your post, Marion. Also, I don't think Camillas family has any interest of celebrating with the BRF. They are grown up with their own families and their father. I think that the current arrangement of Camilla leaving after lunch Christmas day to celebrate the evening and boxing day with her family is their preferred arrangement. People also complain that Diana wasn't "allowed" to celebrate with her family. How do we know that? Do we even know if they wanted to? Since she's from a divorced household with remarriages etc I would think it rather awkward for her parents and partners to celebrate together at all and even more so with their son-in-laws mother the Queen :P William and Kate having Anmer Hall makes it a more smooth version of the holiday. You both could be correct -- since Camilla missed the lunch too, perhaps it is truly an injured back. Camilla has certainly been doing engagements in recent days though, including the Olympia Horse Show -- one she could easily given a miss. She was seen stooping down to a miniature horse but she was wearing low heels -- so hard to say how she was feeling. I do think it a shame that the William and Kate chose to lunch with the Middletons. The queen is much older and they won't have many more years with her -- while many with the Middletons. So often, I've met people who regretted not spending time with elderly relations after they were gone and wondered what they had been thinking. The queen can give William as a future king, wisdom, insight, and the benefit of experience that is unmatched in the world. If I were him, I would take every advantage of being in her company -- for today she is who is loved and is holding the monarchy together. Marion, I do not believe for one second that there is a strong bond between Camilla and Kate. I think Camilla set out to portray that scenario starting with the engagement lunch (sort of like she did with Diana...ugh), but a beautiful young woman/future Queen is not the face Camilla wants to see on her breakfast table. And the C&C charm bracelet hasn't been seen lately, has it? I think that speaks volumes too. I believe Camilla's approach (publicly at least) has been more about manipulative and territorial behavior than anything remotely sincere. Here is something to think about - the Queen will be in residence through the middle of February and William, Kate and George live two miles from her. I don't think missing one luncheon with the entire family on Christmas Day cuts into William and Kate's quality time with the Queen. I think they will see her more then ever before. That's why I don't think W&K missing that one lunch with everyone mattered very much to her. -Recent rumors: The Queen will announce she will abdicate in her Christmas speech. It did not happen, but it is the other signs that could be interesting to history lovers, journalists, observers etc. -The coincidence of Camilla’s disappearance from BK Christmas lunch. -The disappearance of Camilla from Christmas day. -The appearance of Kate’s family for Christmas church service (ok fine, but just the coincidence of everything). -The reported disappearance of William and Kate from the Queen’s lunch is…? -The appearance of the Middleton prominently in “taking over” the place of the traditional Windsor Christmas lunch as the heir to the heir uncharacteristically separated to join them over the Queen only 2 miles away. Well men can be swept by their wives, but this is a different story. -The ever artistically fashion expressive Kate’s entire outfit fits very well for either a fictional or real “truce or disagreement” among the house of the heir, the heir to the heir and the house of the Queen”. The Queen’s message touches on TRUCE as a theme from Christmas day, WWII fittingly. It also highlighted, sometimes reaching compromise is not easy and also stating Jesus as Prince of Peace. She is wise at her age and had seen it all and it seems even William’s action seems to be accepting certain factors. Royalfan, I think Camilla would need a hat the size of Beach Blanket Babylon in San Francisco to outshine Pippa's er.... tush. But given some of Camilla's demented chicken hats, she's probably capable of that. I will concede that Camilla may be hurting and probably wanted to spend time with her family --- don't think she's too badly off -- she was at the horse show and flashing sapphires within the last week. Bluhare--- Camilla hasn't grown on me, but I'm accepting we're stuck with her. To a point. Maryland --- and all others. I will concede also I'm more a monarchist than a Duchess Kate alone fan. To me part of the importance of the royal Christmas lunch is that is part of being royal. Being royal carries many privilages and also areas that require sacrifices -- and at traditional royal events -- William and Kate should be there. They are the Duke and Duchess of Cambridge, not Bill and Cathy Middleton. It is part having time with the queen, but part being a prince too. If William promised Kate otherwise, he made her a promise he will eventually not be able to keep, and the sooner he realises that, the better. Royals have always taken care of their families, from Sophie's father to the queen's mother-in-law but they have done so very discreetly. Increasingly, the Middletons aren't being discreet As there is more and more publicity about William spending time with "Mum and Dad" (and I admit I think Charles is much to blame for not being as attentive father as he should have been in those crucial past years,) it becomes unclear how much influence the Middletons have over him. If there was ever a hint, even a hint, they gave him advice about affairs of state when he is king, it would bring down the monarchy. The time to draw the line is before he gets to that point. Many of us have had spouses who could not discuss their work with us. (At least, I have.) The trouble is the more the Middletons are in the public eye and William puts them above his own family, the less clear it will be to the public that he is really drawing that all important line. When you are royal, perception and appearances are everything and the reason the queen has done such a brilliant job is she has handled that extremely well and has remained royal. A lot to chew on on Boxing Day besides left-over goose but I shudder everytime I read comments in the Daily Mail or a neighbour proudly tells me he's a republican. I want the monarchy to survive and thrive and sometimes that means a bit of tough love. On a more serious note, your reference to in-laws being dealt with "discreetly" almost suggests that there is something wrong with a royal acknowledging extended family. The Queen's children grew up with tradition and "tough love", as you put it, but where did it get them? I think some of the public lessons learned in the 80's and 90's suggest that the current approach is a far healthier one. Dear Leo, Does your pronouncement about photos include Lord Snowden's picture of Princess Margaret in the bath, wearing the Poltimore tiara?? :) And the rest of his royal photos, once they were married, for that matter. It is interesting that the awareness of the value of This Queen especially becomes magnified when matters look off balance from new comers. Beyond Great Britain and The Common Wealth, she is remembered by different generations even by the virtue of being Queen Elizabeth of England as well as her country’s actions and her own life during and after World War II. Her reign started at a critical time in history of the world and she had been part of it and continued as a symbol of times of peace (at least an absence of major world Wars). The excitement about William and Kate is also because the world is re-invited big time to reconnect where the image of the BRF left off in 1997 after Diana’s death. Even the Queen came through as some bad character to the world news observers after Diana’s death. Although William and Kate’s love story and destiny is incredibly mesmerizing, if and when they go off line, it could back fire against them. To miss the elder Queen’s traditional lunch is also SYMBOLICALLY ( what is among them is another story) disrespectful as could be within many families with elder patriarchs and matriarchs (especially if the tradition had been going on for years). Prince Charles can be a formidable leader in his own right. In fact, dubbed as “mobilizer”, “activist”, “outspoken”, he could change the monarchy in some ways. His undoing is of course the story of “crowded for three in a marriage”. I am sorry but the father might be more than ready enough and experienced to be king before his son however the sentiment otherwise from William’s funs. The one difficult obstacle could be where society stands DS vs CP-B (the whole background) and where the world is at in terms of forms of government. Whoever replaces the QE will have a big shoe to fill in a different way. Times have changed. Actually many thanks for your recent reference to some information on another thread of the same blog in response to someone else ( may be two-three days ago). I googled “The Kings Killers” by Earl Charles Spencer. One thing led to another and I was better enlightened about Prince Charles as well. I knew of Charles Spencer’s outlook and achievement from his speech and how his first book outsold Bill Clintons’ first biography. I did not know he had written other books (readers reviews were amazing). Prince Charles, I voluntarily dismissed until William’s engagement although here and there aware that he could lead in 21st century. I found some interesting articles by the Guardian’s publication including Jonathan Dimbleby’s prediction. It was a quick read over all, but my impression of Prince Charles was upgraded for the better. A very Happy New Year to you and yours as well. The Queen’s message touches on TRUCE as a theme from Christmas day WWII fittingly. Thank you Charlotte for the " correction" post. Peace and a very Happy New Year to you, yours and all commenters here. Many thanks to all responses!! As for Lord Snowdon, he was a professional photographer before he met Margaret. (Lord Litchfield was another who crossed bounderies.) However, no, I don't think his bath photograph was appropriate. He and Margaret stepped out of the usual royal mould and Margaret especially paid the price for it heavily. Public tolerance wanes as beautiful princesses grow older. Just read a biography of Lord Snowdon by Anne de Courcy and would suggest it. Eye-popping! As for lessons learnt -- too much emphasis and going too far the other way. Anne's marriage broke up because her husband was unfaithful. (His next marriage broke up too.) Andrew's broke up because frankly Sarah was suitable to be a royal wife. I don't think you could have done anything to make her a suitable royal wife. The instincts weren't there. And she was very close to Daddy who was much in the royal picture until he proved to be an embarassment. But the Middleton siblings don't seem to be very mature (nor does William). They cling to mummy and daddy and neither Pippa or James have yet cut an independant figure. "Solving" one problem doesn't mean that there aren't others and I think the Middletons are standing just a bit too close for comfort. Meant to say church and "unsuitable" for Sarah. Freudian slip, I suppose. Merry Christmas Charlotte! As always you come through with the best coverage of Catherine and the family. Thank you. Everyone looks great. So glad to see that the Middleton's were included......very gracious of the Queen. The coat itself is nice, but I wished she went with something with a bit more color. I have to admit I was surprised to see the Middletons at church today. I know they are staying nearby at Amner Hall. But we always hear that the Queen has this policy where only her family members are invited. No in-laws allowed. We never hear about the other royals' in-laws joining the royals at church. So I hope this means the Queen will allow other in-laws can be invited too next year. Or maybe they have before but the press never reports it?? I I don't mean to start anything, I'm just surprised that's all. Charlotte any thoughts on this or have you heard something from other royal correspondents? Thank you. Merry Christmas! Sophies widowed father is always there. Don't know if he goes to church but I know he stays at the castle. If I understand things correctly the parish and their families goes to this mass as well?... Don't know how it's decided who from the village gets to go and not the spectators. Probably some kind of RSVP or something. So they went more like family of... than as royals. I think?? I don't think the Queen will invite other relatives next year. If she invited all the other in-laws, Camilla's children & their families... that would mean A LOT of people. It doesn't seem doable to me. I've also read that Sandringham is one of the smaller royal homes and simply doesn't have space for much more people than they already have coming there for Christmas. I think it's a bit of a different situation with the Middletons because William and Kate do have their own house there. I think it's nice of the Queen to invite them to certain occasions such as the church service but they won't be present for all the activities and as you can see there's a certain line (they were invited to church but did not walk there with the Royals). I think the Queen is very aware of William's reluctance to fully embrace his role in the family, and she must also realize that his active, engaged presence is VITAL to the continuation of the monarchy. (Its not like he could choose to abdicate; for one thing, he'd never do such a thing to his son or his brother.) So she is doing everything she can to accommodate William's wishes and to keep him happy and close by. He is very close with the Middletons; the Queen can't have them as rivals for his loyalty -- because she might not win -- and so her only other option is to bring them into her own family circle. It's a wise choice. I agree with you Juniper, William has shown many times that he is a man who knows his own mind. He is very protective of Kate and close to her family. He's experienced the warmth of informal family Christmases at the Middleton home, and no doubt enjoyed it immensely and wishes to create a similar feel in his own home. He is also very close to the Queen, who as you say is a wise woman, and wants to both keep him close, and be respectful of his wishes. I don't think the Middletons attending the church is so unusual per se, unless attendance at the Christmas service is by invitation. This would not be typical (but may be with Royalty involved? ), where locals are able to attend the nearest church. Also, with the Middletons staying at Anmer with their daughter (and other two children), it would be somewhat un-Christian to deny them attending a service on such a religious occasion. That's my thoughts, and no doubt the Queen has some difficult decisions to make with events such as these. She appears to be both sensitive, and adhering to her own traditions. I hope all the Royal family enjoyed their Christmas celebrations, and no doubt the change in circumstances is William and Kate having their own home nearby, so that they can include her family. This way they can take part in some of the royal traditions, but also 'do their own thing' with her family at other times. I hope you all had a very merry Christmas everyone! Well, if you give someone a house, you can't then dictate who gets to stay there. I think this was all very intentional by the Queen and Charles and is long term planning - these grandparents are more reliable then the royal parents and grandparents and will be very close to the Cambridge children. The Queen will one day be gone and William hasn't got a maternal figure - he may get along with Camilla - but I think Carole is the stand-in for Diana. They want those grandchildren to have that close bond - when Charles becomes King - the Cambridges (now Wales) will probably be staying in the Big House for Christmas and then over to Anmer when the immediate family is excused. The Parker-Bowles children will most likely have similar accommodations. Not property owned, but use of a property while their mother is in residence. I don't know that it is a "rivals" situation, but more of a looking out for the best interest of the children of a future monarch. George and his siblings are obviously destined to be close with his Middleton family. I read this post prior to updates on other web sites. As usual I like reading anon from Leominister's post,but the counter debate by other posters also reasoned sensibly. After I found out William and Kate parted the Queen's family post church attendance for lunch with the Middleton, the puzzle pieces started forming. If I was a good psychic, a mystery novel writer, image reader, an investigator or a plain lay person with some common sense, I will side would anon-Leominister. The more I "see" deeper the more I came to appreciate you in a bigger way. Thank you for your posts and I hope your holiday continues to be merry. My post below Moxie was meant to be posted below, anon from Leominster25 December 2014 at 16:37. There the onion is getting peeled, the truth is getting close to unravel by virtue of the posters reasoning from facts, hints, reports and "some sense". All reasoning are interesting in their own ways, but I probably made the error of posting my comment under 25 December 2014 at 17:12. Well might be too late. Regardless, it is a mind boggling turning point in the life of this couple and the history of the Queen. Many thanks for taking the time to read, Anonymous. Appreciate it, as well as the time and the opinions of others, wether I agree or not. A happy New Year to all!! Merry Christmas, everyone! Yes, Kate looks happy and healthy, and that's wonderful. Honestly, however, this is one of my least favorite outfits ever. I have to admit that I'm not a fan of the color brown in general. .. and I really don't understand why someone would choose to wear brown—of all colors!—on Christmas Day. Of course, it doesn't always have to be red or green, but something more festive would have been nice. But that's just my opinion, and I realize that others may find brown to be an elegant choice. Thank you, Charlotte, for such a speedy post. I agree on the colour. Brown suits ver few people and always looks drab. Brown can be a very elegant color, but there was nothing elegant about the rough tweed of that coat. This was only the second Moloh coat Kate has worn, and neither was a hit with me. LOL.. That is so sweet! Thanks for sharing. I don't care what anyone says! She looks like a true royal today in that coat. Very upscale design with a beautiful length. Very respectful and not "look at me!". I think so too anonymous 18:49. I loved the flash of orange lining as well. I would have loved to have seen the ankle length coat on her though. I hope you're all having a wonderful day.Thank you all so much for stopping by and sharing your thoughts. A couple of quick thoughts on today. Kate's coat is by British brand Moloh. The post has been updated with info and new photos. It was lovely to see the Middleton family at Church this morning, it's very telling of how good the relationship is between them and the BRF. For those in the UK, Downton Abbey begins at 9. We're just about to enjoy it with a traditional drink or two here. Are you all having a nice day? Merry Christmas! Thank you so much for spending part of your day working on this post! Enjoy Downton Abbey. I'm so jealous I have to wait until January to see it on PBS. Yes Charlotte, lovely day with all my boys, a wife, fiancee and girlfriend :)))) and other family members. That's a sharp observation Rebecca and an interesting theory. With George, she announced mid pregnancy when HG was well behind her and all was going well that her maternity leave would begin 2 months before her due date for no known medical reason. Also starting with maternity leave, there would be no more public appearances. So the assumed and logical reason for this was that she did not want to be photographed heavily pregnant i.e. vanity. Her maternity leave started ONE month before her due date. I read somewhere that a woman in the crowd asked Kate how she was feeling, or said she looked good or something, and Kate said something about feeling really big. I don't think Kate has an eating disorder at all, not at all. I do think she is a bit vain and appearance-oriented and does not like being pregnant. So I wouldn't be surprised if she chose even hats that make her face thinner, or anything at all. Anon 08.18, yes her maternity leave technically began June 15 after an engagement. But don't forget, she took the entirety of May 2013 off. So yes, she did get an extra month off there. Anyway, she reappeared in June. She showed up when she was bigger than she had been in May. Sure she is uneasy being big - anyone would be, having to look perfect in front of the whole world. Did you mean May of 2014? If so, that month was right after an arduous tour, and Kate re-appeared with something that appeared to be an injury or incision healing on her leg. I don't think May of 2014 could be considered part of her maternity leave. There's a royal protocol about not being seen in public after a certain point in the pregnancy. I don't think Kate really had a choice about that. No longer true and hasn't been for a long time. Diana was seen on the balcony and at polo and Ascot just days before William was born. She wore a pink dress to the latter with a sweet little hat and a green coatdress to the former. She was quite enormous at that point and I remember hoping that she wouldn't go into labour as Charles wouldn't like his polo game interrupted. William appeared to arrive slightly early but that proved to be Diana just trying to throw the press off, as I recall. Anne also worked right up to the last minute -- but no surprise there. I believe Sarah did also. Sophie may not have but she had an emergancy labour the first time -- Edward was in Mauritius-- and I'm sure she was cautious the second time. Are you sure her coat is shorter? It seems to be mid-calf on Kate, and she's quite a tall woman. Thanks Charlotte. This was a extra special treat. I love, love Kate's coat. At first, I thought it was brown and beige, but after seeing it up close, I am even more in love with it because of the deep berry color. Love that she picked up the berry color in her hosiery and the color of her dress in her pumps. I would love to see Sophie's hat up close--it looks interesting. 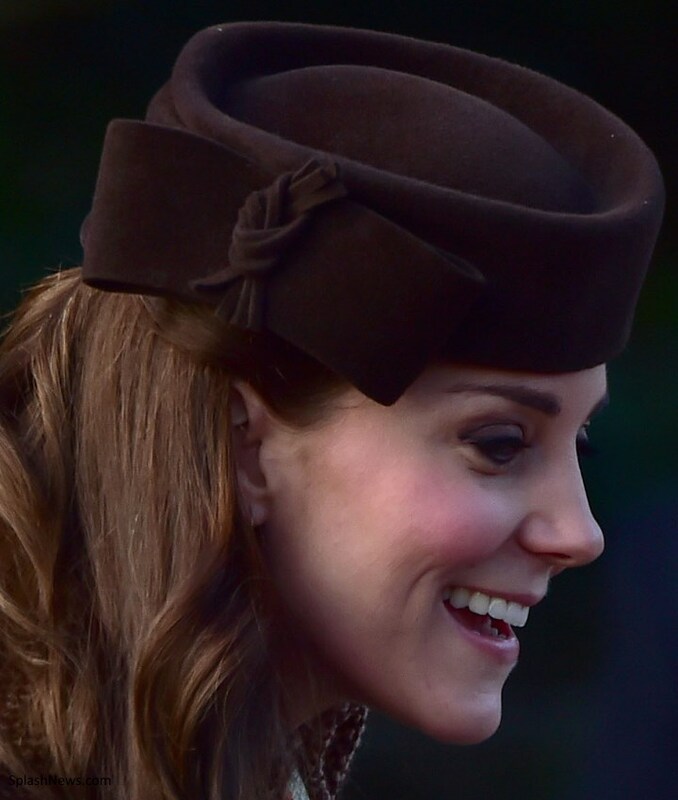 I am thrilled the Middleton's were in attendance and understand why the little Prince could not. Everyone looked happy! I had to laugh out loud when I say Her Majesty's ensemble. We on this blog will understand why---She is wearing pink! She looked happy, healthy--as they, looks like she is in the pink! Love the color of the coat, the matching hat and the jewels. I am having a great day and I am off to spent the rest of the Hols out of town< yeah!!! Best Wishes for a Merry Christmas and a Happy New Year! This is a great coat. I love the color, cut, and the style of tweed. I just wish it was shorter. It looks like the royal family is content and at peace. The Queen must be so pleased. Merry Christmas! I absolutely love Kate's ensemble... head to toe. Earth tones are my personal favorites and I believe that Kate chooses her own outfits carefully, especially when the queen is also present. One never wants to "outshine" her majesty. The tweed is perfect for country, yet with a dash of sophistication. I'm happy that the Middleton family was included and I don't believe for a minute that is why Camilla was absent. I read a comment somewhere that she probably wanted to be with "her" children on Christmas day. I did see at least two unfamiliar gentleman in the pictures. I think they may have been personal protection officers. When the royals are out and about with the public, their own safety is always a concern. There are a lot of crazy people out there. I often wondered how they decide who will be allowed to get close enough to chat with them. I'm sure they must be "screened" before hand. A subject for another day perhaps. Thank you, Charlotte, for bringing us these wonderful photos on your holiday. I hope you and all of your readers had a happy Christmas! Everyone get's screened at this occasion before getting to stand by the barricades. Or so I have understood it. Apparently one man started yelling at William though yesterday. 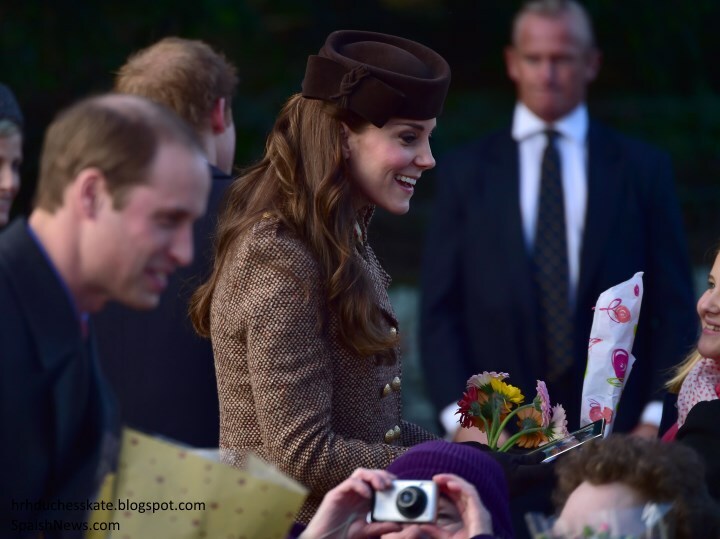 What a beautiful tweed coat, worn with my favorite of Kate's hats! She looks so nice for Christmas services in the country. And much warmer and more elegant than last year. Pictures show that her pumps and tights are brown, but I hope she has received lovely brown gloves and a clutch for Christmas. The scarf is perfect. The Daily Mail makes it look as though Pippa and James Middleton walked to church (I haven't read the text yet). I wonder how Autumn Kelly and Tim Laurence, for instance, feel about the Middletons' presence. The Middletons were there among the people attending church, not the royals. They were their daughter's guests, not the Queen's. So, nothing to feel about. The Middleton's were guest at their daughter and son-in-law's house. W&K have every right to include them and it's only right that they be allowed to attend Christmas Day service with them. The other royals mentioned above (Autumn Kelly, Tim Laurence) are guests of the Queen at Sandringham House. Very true, royalfan, but the Queen has enabled the Cambridges to include the Middletons (and spend Christmas time with them at Sandringham rather than going to Bucklebury every other year). It was Autumn's somber face on the church steps that made me wonder. She brightened up during the walk back to Sandringham, when Prince Charles gave her some attention. I have no idea what was being discussed in the background of the pictures on the steps, but Kate and William in the foreground looked quite happy. Anon, I did notice Autumn's apparent mood, but I am not ready to assume it was due to the presence of the Middleton's. William's bond with them, and the reasons surrounding it, are unlike any other royal/in-law relationship. And even if Autumn's expression did have something to do with missing her family, I would ask why Peter doesn't spend a Christmas with his wife's family before I would lay this at W&K's feet. I have always thought that Kate plans her attire very strategically and carefully. The black lace DVF long gown I believe she knew she would be wearing at the theater as well as the black tie wedding. I really did expect to see her repeat something from NYC today but here she is in a coat from 2013. Perhaps she borrowed it from her Mother's closet? Which has done before. Just a thought. I found her choice very fitting - especially with the addition of the scarf. I do hope we'll see Kate at many events in 2014 including the handing out of Shamrocks in March. Hoping that William and Kate are enjoying this holiday with George and both of their families. I like the outfit, the coat is wonderful though I personally do not wear brown much. Suits her skin tones. The coat doesnt NEED to be Christmas colours - I wore a black coat today? She looks nice and happy and healthy today. Hope everyone had a wonderful Christmas! I've read many of the comments regarding in-laws and I just wanted to share some thoughts. Sophie's father lives with her and Edward and he is seen with the family although he is in the background. And let's face it, the photographers aren't stalking him. Also, Camilla moved her father into Clarence House before she and Charles were even married. Regarding Camilla's absence at the lunch and on Christmas Day, she must be in bad shape because I seriously doubt she would miss the opportunity to grin and play "I'm next." And as for her family being with the royals on Christmas day, well, I'm sorry but she's lucky *she* is there. Never mind the Parker-Bowles clan. Given her popularity with some people and the path that got her to where she is today, I think everyone involved recognizes that it's better for her to make a Christmas appearance with Charles and do what she needs to do privately. And I don't think the Middleton's are "putting themselves forward" as someone stated. If they weren't welcome, they wouldn't be there. William is close to the family and he knows how important they are to Kate. I see a man who has a set and is determined to see to it that his wife has a different experience than his mother did. And the Queen is going along with it because of lessons learned and also because as a grandmother surely she must recognize what a good influence Kate and the Middleton's have been in his life. OH royalfan I so agree with you. I know William said in his interivew that he has learned from the past. And I am glad the Queen see's wha tthe Middletons mean to him and George. William will always do what he feels is best for his family and if putting the royals in second place, I see him doing that. How much art in the speech of Queen Elizabeth, this Christmas! I wonder if she picked up some suggestion from conversations with Kate. Oh that is an insightful comment. I think from having heard past conversations of the queen on film, that she knows a lot about art with no help from Kate. She does have a few nice pictures hanging around in the palaces. Of course she does, Leo, you are perfectly right. What I meant was the way she employed art in a speech that was not about art. The symbolism of art, the art as a language: it is something Kate is deeply involved with. She is not the one nor the first in the R.F., Prince Charles is an artist (he is an excellent watercolorist) and, as Leo said, all the members of the R.F. have some nice paintings hanging on the walls of their mansions… Maybe, with an expert - like Kate is - in the family gatherings there are more conversation about art than before. Leo, if the Queen can discuss military history with Sophie, I see no reason why she can't discuss art with Kate. I honestly don't. Think they could have conversations and very much hope they do, Royalfan but don't think the queen needs Kate's imput in writing her speech and that was what I was responding to. Still, who know, maybe Kate was an influence. Haven't seen much yet to show Kate has any deep interest in art (other than the fact William was reading it at St. Andrews and was likely to as it was one of his A levals - ) but I will be delighted to see her more involved in the future. So far, only a few photographs and her patronage of the portrait gallery which has led to two or three receptions. Leominster, William read geography at St. Andrews after one unhappy term trying art history. 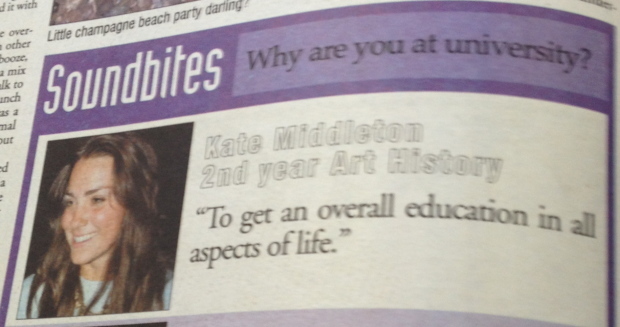 Catherine is the one who actually did art history and earned a 2:1 degree in the subject. That's true. Kate is the one who persuaded him not to leave St. Andrews, or so it is said. Interestingly, Anon Canada, William was supposed to go to Florence at the same time during his gap year and pulled out. Then Kate went to Chile on the trip after William. Poor timing! Bluhare - thanks for that bit of interesting information. I know there has been speculation that Kate pursued William, but IMHO this no longer warrants a debate as the history books have been written regarding their meeting, courtship, breakups and wedding. Thankfully, from accounts from those who meet them, their union seems to be a happy one and hopefully it will continue. Love the outfit---beautiful coat and the hat is a favourite with me. Just one thought---the length of the coat seems to be ideal for tall boots. Seems HM did not wait to collect flowers this year. Noticed on her broadcast she sounded hoarse---so perhaps by now has a heavy cold. Nice to see she has excepted what most families have always accepted that spouses' children and grandchildren like to see their own families too. Going Mad!! You will all be remarkably long-lived if you are around for 2915! I wonder what will happen 901 years later and where the copy of this blog's archive will be shelved. My thoughts on the Middletons - they looked after Prince William during his 20's and he is very fond of them. Charles' lifestyle is such that he travels frequently, maintains a formal household, and may not have always had time to create a family atmosphere for William and Harry. William spent 10 years with the Middleton Family before marrying Kate, calling them Dad and Mum - this is what is different between him any other member of the family - his relationship with his in-laws has been more intimate. Camilla and Anne are on 2nd marriages as adults when their children were grown, and Peter was not immersed into the family life of his spouse who is from Canada. Like it or not, except for Camilla, William outranks every other family member - so much so he was given Anmer Hall by the Queen to set up the cozy life he wants for his children - William (and therefore Kate) is expected to sit on the throne - not the Laurences, Kellys, Tindalls, Wessexes, Yorks,... When Charles inherits the Big House - he will most likely run it like Highgrove - which is not necessarily flexible for children - so this current set up gives William space to run a country household the way he prefers - which is with his in-laws. The Cambridge children will have a Grandfather who is King - who most likely will not be able to be a day to day grandparent like the Middletons will be. They will function for the kids much like The Queen Mother functioned for Charles. A consistent presence in the sometimes random lifestyle of their royal parents and grandfather. New Topic: It occurred to me that I've never heard of a royal visiting with Santa before. I know the royals do gift exchanging on Christmas Eve as the Queen believes Christmas Day is a religious day. Does this mean that they've never done the Santa tradition? Might this be the first time William opened gifts on Christmas morning? (Or 2nd since he stayed at Berkshire one year?) Anyone got any information? Did Diana take the boys to see Santa? Thank you for mentioning Beatrice. What the hell was she thinking? That for church? On Christmas???? The coat . . . the shoes . . . there are no words. There are photos of William and Harry with Father Christmas, or with Santa if we must call him that. It was when Diana took them to a concert for Armenian Relief. It sometimes reminds me sadly of how many charitable causes Diana brought attention to-- sometimes combining her work with nice outings for her sons, and how rarely William and Kate do that. Still, a lovely visit for George and he put in his public duty hours in Australia. I believe Diana once also encountered Father Christmas and his ponies -- I remember seeing a photo years back but can't find it online. Never heard of William or Harry having a private visit, although they may have done. bluhare, my answer to your question is this.... simply shake your head in disbelief, add a dash of sympathy, and think of Sarah. We all have to remember William has a reason to be very protective of Catherine & George. While I wouldn't wear what Beatrice wore to a church, we have to remember she is a private citizen, she can wear what she likes, she is not working for the RF. When we complain about Kate's choice of dress for work, it is for work and professionalism as she is representing a nation and HM. Big. Difference. Something that has been explained over, and over, and over, and over, and over, and over, and over again. Wait. How is the Duchess of Cambridge working for HM more than Beatrice is? Neither gets state funding. Beatrice has Royal protection officers. She will be a counselor of state before Catherine will be. And she has precedence over Catherine (except when William is resent, and incidentally, did anyone else notice Catherine exiting the church behind her Majesty yesterday? It occurred to me after pausing to think- with Camilla absent, and William present, she was second lady in the land . . .how special for her parents to have seen that, I am sure she must have taken precedence ahead of the rest of the royal ladies before, on other occasions when camilla has been absent, but I can't think of another such public occasion when she has done so). Private citizen? Not quite, Stephanie. She is a royal princess and she was attending church on Christmas Day with the Queen. She also happens to have two parents who are most anxious for their daughters to be seen as royal, and she has done some charitable work as some here have pointed out. Not working, but going to church. That coat is inappropriate for the occasion, and Beatrice IS part of the Royal Family and a public figure and together with the other royals and at a public and photographed occasion. We don't comment as much about her mostly because we don't care as much, and because she's so always trying to draw attention with bizarre clothing choices that she ends up being dismissed as childish. I still like Beatrice's coat. This thread is about what people are wearing on a walk to church. The camera is pointed at them because they are the Queen's family. Beatrice and Kate ARE the royal family. Rebecca Deacon, Jamie Lowther-Pinkerton, and Miquel Head WORK FOR the royal family. Kate actually has not represented Her Majesty in any capacity - she didn't make it to Malta. William represented the Queen in Australia, New Zealand, France, Belgium and Malta. Kate accompanied William as his wife. Kate is the equivalent to Philip and Camilla -- not destined for Elizabeth's role. Kate is not in line to the throne - you know who is? Beatrice at number six. And as I like to explain over and over - Kate does not work - Kate makes appearances in which she is the guest of honor - often receiving flowers and gifts. When is the last time you showed up for work and someone handed you a bouquet of flowers and a teddy bear for your son? And then no one expected you to show up ever again? In conclusion - Beatrice can wear hoofs and short skirts to church and anyone can comment on that because she knew she would be photographed - and we have free will. Very. Important. To. Remember. Have to admit I was stunned by Beatrice's coat, not just its length either! She is a private citizen but still she is going to church with the queen. I think it was a poor choice quite frankly. Wow, I just saw the pix of Beatrice! That coat is incredibly inappropriate, and she didn't seem able to walk in the shooties. I thought she looked rather silly. She can choose how to look, and I can choose how to think of it. Yes Royalfan, she is a private citizen, as in she is not a working royal, she does not receive money from the taxpayer, and she gets her own job outside of working for the RF. Thus, she, and her sister, are private citizens. I find it interesting that Princess Beatrice of York is referred to as a private citizen. Meanwhile, when Kate really was Kate Middleton, private citizen, many people denied her that status and argued about the "choices" she had made (in being William's girlfriend). Anonymous, you said William has reason to be protective of his wife and child. What reason is that? Please don't tell me because of Diana. Kate is no Diana is any way shape or form and I don't see her playing that game at all. And, royalfan, here's your Christmas present. I agree with you. Beatrice a private citizen? No, she isn't. She doesn't support herself. She either has trust funds or her grandmother or father help her. Same with her sister. Eugenie isn't living in NYC on $30K a year, which is what I read her salary is. Not only that she's got no last name and has "Princess" in front of her first one. Kate is hopefully a future queen, married to the heir but one. In theory, her whole life should be dedicated to the throne, its well-being and survival. And all choices she made when single seemed to be designed to win William,at least once she had met him, and quite possibly before. There is no reason why Beatrice and Eugenie couldn't work as royal princesses (it can be a job). Their father would like them to and Alexandra, the Kents and the Gloucesters all took on public duties and have been very popular and a large asset to the monarchy. I doubt the queen would object to Beatrice and Eugenie taking on a larger royal role, she seems to like a large family around her. The decision to not have them take on full time royal duties seems to be Charles' for the most part and his supposed plan to streamline the monarchy. This may be due to financial considerations but also may be due to his perception of the public mood which could be seen as less tolerant to a lot of royals. It could also be due to his relationship with his siblings. There was no indication that Anne intended her children to be anything but private citizens from the start. Mark didn't take a title. Anne does have a title (The Princess Royal) traditional for the eldest or only daughter of the monarch but it won't be passed on. I doubt that Edward intends his children to take on a royal role either since they aren't using prince and princess at this point but there will be a generation gap after William and company and before George is old enough so time will tell what happens. So far the info I have is Princess Anne did not want them to have a title. Well, let me believe the commenters information on this blog that was not the case. Still, wouldn't Zara at least been Lady Zara and her brother, whatever the male title he could have gotten? Her coat recalls pre or post war Europe. The hat with the coat somehow stands out as American navy hat. Over all the complete brown ensemble with her entire look including her face is like some artistic cooper statue somewhere. The daily mail reported that W&C went to their own home to join the Middleton for lunch instead of the customary expectation of joining the queen. It was the queen who gifted them Anmer Hall and it makes sense to make her the first honorary guest. Although the Middleton deserve their presence as they are with W, C &G through the worst of times as well being family, it seems the elder queen is somehow put aside. And, you know, shoving ahead of HM, or trying to before Rebecca or someone pulls her back, on multiple occasions the last 4 years. I understand its 2014 and modern times, but this is like shoving ahead of the Bride and Groom to fill up on dinner. Just rude. WK are not close to the RF and it shows. It's unfortunate, because while their events are quite structured, the RF has a lot of love in that family, and they give so much to the people they represent. WK just don't seem to have a lot of respect for their position and the family. Shoving ahead? That doesn't even fit her persona as described by the people here who *don't* like Kate. I also don't think they are disrespecting the RF by respecting the Middleton's. Hmm. The only person I've ever seen shove herself in front of the Queen was Eugenie. The same girl who literally shoved past Catherine and William to run up and "help" Granny with collecting flowers, a year or two ago at Christmas. There's video of this on YouTube. They had already left the church, and that is what Eugenie and Beatrice do every year, help collect flowers for their grandmother. True, Anon 18:56. Thanks for the reminder. I like the Queen's speech. Last year she had her parents picture near her. This year she had her grand parents picture on the the table close to her. It seems to complement the WW II commemoration (100 years) as well as the speech and King George V whose reign was during that time. I am most familiar listening to WWII stories growing up. May be hooked on II. 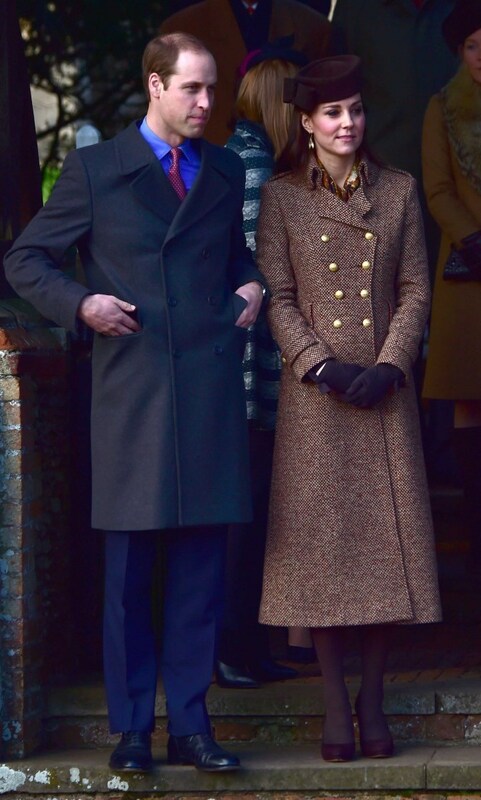 About burgundy coats: Pippa Middleton wore a burgundy coat at Sandringham this year. 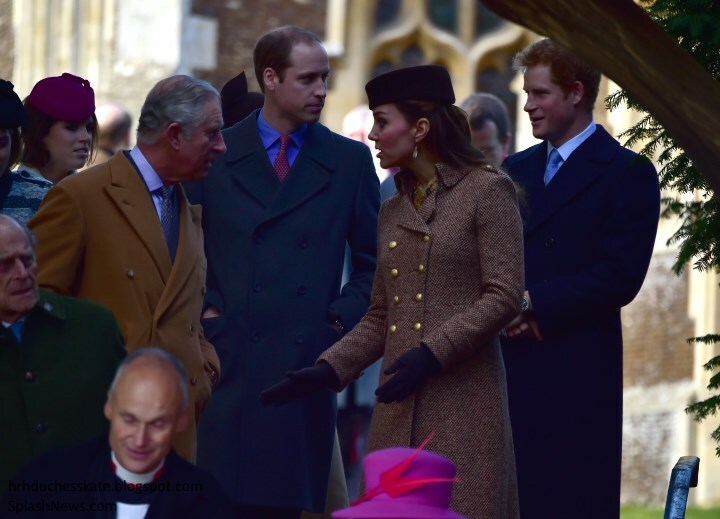 Kate wore one in 2011 at Sandringham, and in 2012 she also wore a burgundy coat in Bucklebury. The sleeves of these look different, but maybe she wore a bracelet over the sleeve in 2012. Carol Middleton also wore a burgundy coat that year. For pictures, see the previous post. Question, did Pippa wear one of those two or three burgundy coats, or does she also own one? Sorry, meant copper As in statue coated with copper. Loved the outfit, and I'd love it if the scarf were ever properly identified, as it's gorgeous, but, as other commentators have said before me, the look had hardly anything festive about it. Block colour brown is certainly not what springs to mind when you think about possible Christmas looks! Also, about George's "overexposoure"...Well, he hasn't actually ever been seen in public on UK soil, apart from when leaving the hospital and very few paparazzi shots, so my humble opinion is that this really isn't a valid justification. I'm all for not taking a child so young to a church service, where he'd possibly been disruptive, but he could easily have made an appearance on the walkabout, even a brief one. It's not a good thing to keep the third in line to the throne so shut away and secluded. People actually need to see this child every once in a while, and sort of "get to know" him and be able to relate to him if he's to be a well loved sovereign in his own time. Prince Charles and Princess Diana used to have plenty of family photoshoots and scheduled appearances for William and his brother, even when they were very little. Even the Queen with Prince Charles did so! If think the Duke and Duchess would do well to take a leaf out of his parents' book and let George be seen in public a bit more often, or risk him being a sovereign his people don't relate to and, ultimately, haven't got much affection for. Also, no Christmas Day lunch with the Queen and the Royal Family? Well, I'm perplexed, let's just leave it at that. Catherine can (and does) spend a lot of time with her own family, they really could make the effort one day a year. It almost seems, in this and other instances, as though they want the perks of being members of the Royal Family without the duties. First, I wouldn't take my one and a half year old to church with his rather austere great grandparents either. As well, Charles and Diana only did photoshoots when the Press rumors of trouble in the marriage surfaced. They usually were only photographed on official occasions--first day of school, family holidays. Granted once her marriage to Charles soured, you saw more of them--I think so that she looked more sympathetic to the press. That is not a criticism of Diana, it simply makes sense. As well, William was the second in line to the throne. George is a very distant third. William may be as much behind not exposing George as Kate; who knows what memories he has of being trotted out. As far as we know, Kate and William spent Christmas Eve with the Royal Family. Lunch the next day was obviously not required or they would have been there. Again, a formal family lunch would be no fun for a toddler. Better the relaxed atmosphere of their family home. And who says they want the perks of being members--have you asked William if he remains third in line by his choice or royal duty? Any thoughts on Sophie and Edward's seven year old son not attending church with his parents and sister? How odd is that? He's old enough and how do they justify keeping him back at the house while the rest of his immediate family attends church? At George's age, however, we can understand that he wouldn't get anything out of the experience and his presence could be disruptive. I think there is an age requirement for church attendance on Christmas morning, or perhaps anytime at Sandringham and Balmoral. Children seem to start attending around the age of ten. I was curious about their son as well. They seem very protective of him and I can only assume that they think he is still too young to understand all the attention from strangers taking photos. It is a wonder that William and Harry survived their childhood living in a goldfish bowl. I wonder if James isn't just a bit rowdy. It would seem odd that they are protecting him when his sister was out at the same age but little lads can be a handful. Some of the European royals have had children act out in church but the queen may not care for it in her family. I think charities with Anne as patron, or other royals that draw lesser attention, won't get the easy publicity that William and Kate, Diana, or even Charles bring to theirs. They do get four things. 1. Quite often the patron makes a public statement on their behalf that will bring attention to their existence and work, even if not the huge publicity an appearance by Kate would bring. 2. Being able to put a royal's name as their patron on their website or in correspondence or appeals will be a cache in fundraising and other support. It encourages other wealthy supporters. 3. The appearance of a royal had fundraisers still brings a lot of attention. And people like to go to fundraising events at all levels -- it raises more money than simple appeals. 4. A visit brings enormous consideration to the employees and volunteers of a charity. It is a big thank you for the work they do and a chance to step out of their ordinary routine, even if the facility does smell of fresh paint. This sort of work reaches people at a core level. One of Anne's most important charities to my thinking is her work for carers, something that could touch all of us, and involving people whose work is often unsung. So I do think the work of royals like Anne is extremely valubable even if we don't hear about it. It is true though that while many of us oldtimers and some younger people recognise that the royal family is working hard whether we see it or not, many other people don't seem to understand that. That's why it is important to keep the work of the royal family in the public eye and that the most popular members set the public tone for the whole family. I doubt I would know about Save the Children if it were not for Princess Anne's long connection with its work, which appears to go far beyond lending her name to fund raising events. She quietly goes to impoverished, sometimes dangerous, countries to find out what the conditions are and how aid can be given. I have read of her chairing Save the Children meetings, too. She seems to be a rather hands on patron. Princess Ann fascinates me as a feisty woman with a sense of independence. The fact that she took her own decision to alter the royal status of her children is interesting. Obviously there is something distant when it comes to what charities she is associated with since the media does just curtesy mention now and then. She had traveled to about three countries recently and no details prominently written enough to catch the average readers’ attention. In her youth, especially from one humorous appearance to a British media, I came to like her. As a member of the royal family she reminds me between ancient ways, Ann herself and Angelina Jolly’s humanitarian sense. She did not decide to alter her children's; royal status---the status did not exist--children of Princesses do not have royal status, except in the case of the then Princess Elizabeth when a special order was made that her children would have royal status. What was refused, either by Anne or her 1st husband, was a title for him, which would then have given the children a title. I have often wondered if she would have accepted, if a title had been offered to her, giving her equality with her brothers.. Thank you, anon from Leominster! I do think Anne is an interesting person with such a great work ethic. It's a pity that many of her efforts remain unnoticed by the greater public but I agree with you that she can and does make a difference anyway. It would be great if Charlotte could perhaps do a post about Anne & her charity work for her Royal Digest blog some time. Hi Leo - it was I who posited the original rhetorical question - I could have put any royal name in there, but I chose Anne since she is very active. I am not an expert in British culture so I am not sure what motivates people to give money or time in your country. It is my understanding that the countrymen have different perspectives on the royal family - that you have wealthy and non-wealthy members who are not royalist or do not pay attention to them. In those circles a royal patronage will not influence support - whether there is media attention or not. My question came about because there was somewhat of a sorrowful lament that rich sports players wives or celebrities were now hosting many of the social functions that were once the territory of the aristocrats and royals. What is interesting about this phenomenon is that usually sports figures come from humble beginnings, and perhaps so do their wives, and are more in touch with the needs of everyday society and are happy to contribute - give back to the community that makes their lifestyle possible. Would I be correct in saying that more people are fans of sport than they are of royals? That sports figures are more relate-able to the public than people who have status because of their birth? What I am learning from your remarks is that you think there is still enough interest in royals that they can draw a wealthy crowd to a fundraising event to support a charity and that name on the letterhead will appeal to some in your society to take part because a royal is doing so. There is much to be said for taking an interest and visiting a charity - the personal attention to people is usually what charities are all about. Whether it is a comedian, sports figure, or royal - it matters to the people who are being served and the people who do the work day in and day out - regardless if there is a camera or reporter there to record it. If possible, can you please post your opinion on the non profit culture in the USA that is especially getting wide spread the last decade? 1. Kate was told by a woman that she looked beautiful, and reportedly, Kate responded "Thank you, I feel big." Probably not a big deal but I wish she would never make a comment like that. Any young woman struggling with body image issues as a result of living in a society with ridiculous expectations for women's bodies will feel even more "big" when she hears someone as skinny as Kate (even when pregnant!) call herself big. Obviously Kate didn't put much thought into the comment, and it was just one small thing, but these things are important when you are as famous and followed as Kate is. It's this comment and the one she made before her wedding when someone noted she looked smaller ("it's all part of the wedding diet") that I think could be interpreted poorly by young (or not young) women around the world. 2. What is with all of the catty comments about Camilla? How disappointing. Some of the same people who get furious when anyone says anything remotely anti-Kate and start crying out about women needing to support each other are the same people spouting ridiculous claims about Camilla. Does she feel threatened by Kate? Maybe. So far, it seems like Kate and William are more intent on keeping/building good relations with the Middletons rather than the Windsors. So maybe the fault lies not solely with Camilla, if there is even any problem at all. Second, comments about her feeling the need to strut out and show that she's in power are really bothering me as well. Camilla is married to the heir to the throne; the Prince of Wales. Yet she is not called the Princess of Wales just because of the memory of a beloved lady. Obviously Camilla made a mistake. But so did Charles. And if Charles and Camilla weren't stopped from marrying before Diana was ever in the picture, the affair would not have happened either. It's not all on them, but rather also on antiquated royal customs. Obviously the affair was wrong. But can we let up on her about it please? Anyways, my point is - if I knew that everyone hated me because they loved the former wife of my husband, I'd feel the need to assert my position in the monarchy as well. Especially when all of the hate already meant I wasn't allowed to use my rightful title of Princess of Wales. Exactly, Maggie. With Kate, when observations on her behaviour the last several years are pointed out and interpreted, its "Oh how do you know, you don't know her and family personally". But when it comes to other members of the RF, claws come out. Well, this catty commenter does support women. In this case, her name was DIANA. Camilla deserves as much "support" as she gave this same lady. Zero. As far as Kate's comment about feeling big. I don't see it as being an issue to be honest. If she stood there, grinned and said "ohhh, thank you", she would be accused of being full of herself. This was a sweet, self-deprecating response. Thank you for observing the error. I have corrected one of them. If the second one is also mine I will chase after it tomorrow. Peace and Happy New Year to you and Yours. Royalfan - are you british? In the U.S., we (ladies) are taught to accept a compliment and move on - it's not seen as full of yourself - which is why I ask. I agree with Maggie that making comments about her weigh perpetuates a culture obsessed with starving women. However, I'm sure Kate's not aware of her role in that stereotype - I'm sure she meant it and is herself trapped in it, if that makes sense. She is tiny though! Stephanie, talking about Kate vs talking about Camilla goes beyond the old apples and oranges comparison. It's more like apples and turnips. Whatever faults people think Kate has, Camilla's "contribution" to the monarchy prior to her second marriage has been well documented. Maggie - I agree with you about Kate's "I feel big" comment. Such seemingly innocuous statements do negatively impact young girls. Plus it's unfortunate that her own self-esteem issues prevented her from seizing an opportunity to be a positive role model by graciously accepting the compliment. royalfan - I agree that some will criticize Kate no matter what she does. But if she graciously accepts a compliment, I would approve. Another example of negative role modeling along with a lost opportunity to be a positive role model was when she refused to play badminton during her Oct 2013 visit to Sports Aid. She gave the excuse that she tried it once and wasn't any good at it. Imagine the positive influence if she instead had given badminton a go and said 'I tried it once and wasn't very good at it but that doesn't matter and no one cares.' Anyway, I hope someone will take note of this and point her to someone who can help her become less self-conscious. As for Charles, he shouild have tossed those cufflinks overboard and told Camilla to back off. There is plenty of blame there too and I will never respect him, even for all the good he has done. Would the marriage of Charles and Diana have worked if Camilla hadn't been there. Possibly not, but we don't know. I do think it is possible that Diana would have been much less nervous without her presence and Charles would have worked harder on the marriage. As for making a mistake, I don't think you would ever find Camilla admitting to that. I think if she were honest, she would say she has been a very clever puss, manipulating Charles and forcing the public to tolerate her -- although few like her. Maggie, anorexia is more complicated than that. It's a mental illness whose roots are found right in the patient's home. Women are prone to group insanity but neither Kate nor any other slim woman is responsible for the 80 pound teenagers. The gay male dominated fashion industry is far more damaging than a tired swollen pregnant woman making conversation. Maggie and Stephanie - The comment about feeling "big" is a VERY common statement pregnant women make AND the way they genuinely feel. And the "wedding diet" is something most women do. It has nothing to do with "anorexia". Kate is just stating what many women say at various times in their lives. Anon at 18:01 — I don't think you read my post correctly. Not once did I say that comments like Kate's are why anorexia exists. But it is naive to think that for a woman who already suffers from body image issues, comments like Kate's won't hurt the fight against eating disorders. Kate is posited by the media as having a perfect body and perfect hair - so for her to say she feels big can only serve to make others feel more inadequate. Like I said - I don't think it's a huge deal in this individual context. But I do think it's important for women in the public eye to refrain from making comments like that. Royalfan - I have yet to see anyone ever criticize anyone for saying "thank you" in response to a compliment. Let's not exaggerate the criticism Kate sometimes faces. As for Camilla - Charles cheated on Diana. Not Camilla. It's never good to be the "other woman", but ultimately, the obligation is on the man, not the mistress. It was a mistake. People make them. She doesn't deserve the ridiculous, and yes, catty, comments people have been making. Oh Maggie. Camilla know what she was doing bedding the Prince while he was married. She could have told him a simple NO. But she idi not. She continued to see him and do other things while he was married. Yes they both were wrong doing this to Diana. IN my opinion Camilla deserves everything she get's for helping to break up a marriage. All I can say is "shame on them both". I just pray that William has learn from this mistake and never do this to Kate. I never said her "feeling big" had anything to do with anorexia. I don't think she has an eating disorder and I don't think she is too thin. The "feeling big" comment, I believe, is more to do with her being vain. Leo, my hands are tired and achy from applauding, but it was well worth it! A-M-E-N.
Maggie, I'm sorry but I have to giggle. We shouldn't exaggerate the criticism Kate sometimes faces, but a sweet, self-deprecating comment (something I define as good manners and humility) seems to make her a bad role model. Many take her "feeling big" comment as vanity. But as I have understood it (not having been pregnant myself) you can actually FEEL big. Like stuffy and crammed and unmovable and such even before the belly is in the way. I think that is more likely what she is describing. That she is being bigger than normal and therefore is feeling it, not just seeing it. Just a thought. It could be vanity but I thought this was worth noting. Also, she would be wise not to say such things as others have remarked, but on the other hand it was just a genuine response.. I used to be bulimic. It had nothing to do with what someone a thousand miles away said about anything. I weighed 93 pounds and hated myself. The insanity was in me due to growing up in an alcoholic household. Nobody outside my house was to blame for my vomiting after every meal. I did not appreciate Charles and Camilla toying with Diana either. She was young and naive and apparently no one sat her down and told her this wasn't a love match, it was a dynasty match. That was the problem there. Everyone else was hoping she'd accept aristocratic mores regarding marriage and toe the line. She didn't. In public that is. In private she did. She had her own affairs, apparently even starting before the birth of the spare (decidedly against old time aristocratic mores) if you believe James Hewitt. Whether she was punishing Charles for having Camilla, I've got no clue, but she was not pure as the driven snow and she arguably could have been charged with harassment for telephoning Oliver Hoare's home constantly and hanging up. Yet that went away. And Camilla wasn't Charles' only mistress. There was at least one other. Maybe more. The only person who should have been concerned about Camilla's infidelity as a moral transgression was her husband and apparently he was happy to share until the publicity got too much. Diana should have blamed Charles, not Camilla, as he was the one with the power to stop that. And he didn't. So yes, I understand your feelings about her, but as most of this was 25 years ago I would hope that there is forgiveness is some people. Camilla did nothing other people haven't, maybe even a few posting on this board. She was unfaithful with another married man. No more no less. Not only that, Diana apparently would call her when she was home alone at her house and ask if everything was locked up tight or words to that effect. Diana was no saint in this. I personally think she was very damaged, and it's a damned shame no one ever tried to help her. But I also agree about the hypocrisy with regards to comments. Say something that could be remotely considered negative about Kate, and you're a subhuman. But comments about Camilla are bloody funny and spot on apparently. Hope you are well recovered, Anonymous. Self-hatred is all too easy and terribly destructive especially in a troubled household. We are a very supportive group here, I believe, regardless of our sometimes differences- and our hands and hearts reach out to all of us with difficulties or illnesses, past or present. I have never thought Kate has an eating disorder although I have to admit it would explain certain things: statements she was going to take on more patronages, that didn't happen, the constantly changing plans, the wish of William to live quietly in the country, Kate's perfectionism, and her need to eat Chrstmas dinner with her parents rather than with the royal family. I could almost convince myself but I don't want to be convinced. Having gone through this with Diana, I prefer to think Kate is just quite disclipined and a bit vain --- not surprising given the attention her appearance receives. As for Camilla, I was a bit windy, but I can shorten my feelings about her down to one sentence. Having observed her, her actions and her statements for some time, my feelings are quite simple and go beyond her simply having been Charles' mistress. I don't find Camilla sincere. I am another anonymous from the one who honestly shared their bulimia. Anon-Leo, it was a well put comforting message. It seems bulimia could have different causes. I have witnessed an immediate family member who was obsessed with dieting, beauty and loved buttery dishes, ate food and forced it out with her finger at her throat during her teenage years. We were not even in a Western country then although the fashion scene and beauty might have competed the West in her immediate environment. It could also be a personal matter from vanity, to society's expectation etc. Over all it may not be a good sign and people need support from families to professionals. It was not as understood as now. One of the reasons I genuinely like Princess Diana had been, in spite of her own faults as any other human, is her honesty about so many things and that included her own self too. Her Panorama interview might have shook up The House of Windsors but it was ahead of its time in its courage of sharing some of society's pains. Kate's "I feel big" is most likely the typical chit chat of a pregnant woman's response to " how do you feel"? Q&A commonly understood. Even to those lucky enough not to gain much weight during their pregnancy, it seems, feeling big is common. In fact Kate comes through as connecting and comfortable among the strangers asking "personal" questions. Well may be not quite personal? the heir's offspring seem to partly belong to the citizens who gathered there to see them since 5:00 a.m on Christmas morning. Each generation and age group might interpret communication differently as what matters to them stands out. Thanks Leominster. When I got married it was too hard to hide the bulimia and I had to do something about it. 20 years have gone by and in stressful times the urge to purge is still there but I will never go back to that. If the alternative to having the Middletons at Anmer Hall for Christmas was William and Catherine alternating years and spending another Christmas at Bucklebury, this time with George along, surely the Cambridges can participate more in the Queen's Christmas this way. We really don't know how much time Kate and William are spending at the Queen's house at Sandringham, or what events beyond church on Christmas morning they are attending. Everything else is rumors. But I love the fact that Prince George went to the children's event at the church near Anmer Hall. Twice among the comments under this post, I saw World War II instead of World War I. I know this is an unconscious typo, but it's interesting that the starts to these wars seem so long ago that they become interchangeable in our minds. As the Queen commented, no one now alive fought in WWI, and those of us who remember WWII even as children are growing elderly. I loved the Queen's speech. It had a certain pathos, an undertone of her acknowledgment of the world as it is, much as we need and would like to find peace in our time. The more we reach for it, the farther it recedes, always just beyond our grasp. As one part of the world settles down, another erupts. The Queen has seen so much of this from her position that she needs to recommend reconciliation; even though she has no real power to achieve it, she has the words she can speak and the hope that they may be influential. Maggie, I'm sorry you are offended by comments about Camilla, but anything you have read here is "mild" compared to what I've seen on some websites. I'm an American too, and I don't think we are in a position to defend or criticize her. We will never know everything, nor do I want to know. When we're gone, including Charles and Camilla, I'm sure there will be many books, even movies made about their relationship. "The Queen has seen so much of this from her position that she needs to recommend reconciliation; even though she has no real power to achieve it, she has the words she can speak and the hope that they may be influential ". In The English Constitution, British political theorist Walter Bagehot identified three main political rights which a constitutional monarch could freely exercise: the right to be consulted, the right to advise, and the right to warn. Some constitutional monarchs, however, retain significant power and influence and play an important political role. It seems Prince Charles could be heading to be the later and controversial. Maybe she feels swelling - somebody noticed that her ankles look swollen. It's not a nice sensation, I can understand her discomfort. Thanks for the quick post especially at Christmas. I loved the whole look. She looked happy. Interesting discussion on many fronts. I always wanted to share this video, it has three parts. I hope Charlotte lets it pass the link. It shows Kate in many situations one from last or maybe previous Christmas. How this walkabout and coming out to the public is handled. This is a fan video although not a too positive one. But I think thats why she needs to do more to have more experience and not to be in anybodys way. The coat is boring, and not for a holiday. It is also too long. She either wears too short coats, or too long.The right length is knee-length. Brown is not her colour. It looks better when the photo is somewhat purple. The scarf does not fit tweed. It should have been one colour. It is her first long coat, isnt it? Second to my knowledge, but the other one is pre-marriage. She later shortened it. I think she looks beautiful in brown. It's not a flattering color for many, but she wears it well. Kate dresses nice but a bit old fashion to me. Her todays look matches the Queens speech about the first war times. Kate looks like a women somewhere from that time: with her coat and updo. Sometimes she dresses like a girl from 60' /70' - she reminds me a nice housewife from an American advertisement. I think it's influence of her mother taste. I know some people may like it but I wish she dresses in more modern way (for example like princess Mary of Denmark). I'm curious do the other royals - Beatrice, Eugenie, Amber, Peter - go and talk to the public gathered outside the church after the service? If they don't I'm curious why not? I know Bea and Eugenie are designated to assist the Queen in collecting flowers and gifts annually after the church service. If they do not talk to the public otherwise, it might be because they are private citizens. Hihi, this is a little fun. Christmas at Sandringham has never been set in stone, as some people seem to imagine. Granted George V loved it, as did George VI---but soon after he came to the throne WW11 started and Christmas was spent at Windsor. Sandringham was considered too near the East Coast. It was back to Sandringham after the war, though the then Princess Elizabeth spent Christmas 1949 and 50 in Malta, with Prince Charles left behind in 49 and he an Princess Anne the following year. When all the cousins were married and had children, the celebrations once more moved to Windsor. When they were all growing up, it was back to Sandringham with only the Queen.s and Princess Margaret's descendants there. That is when the lunch for the extended family started. In 2011 when Catherine first spent Christmas there, it was reported that there were difficulties finding room for them all--in fact it was said that footmen had to be moved and their rooms used for equerries. It seems to me that Christmas, like most other things in the BRF changes when necessary. The gift of the House to the Duke and Duchess will have eased the bedroom shortage. I doubt that Camilla's absence had anything to do with the Middletons being at Church, or Prince Charles and Catherine would not have seemed so happy together as they left the church. The Queen did not remain to collect flowers this year, but left it to the younger generations--including the men. I did not see Princess Margaret's children and grandchildren there this year. so perhaps that is another change taking place. I noticed the absence of Princess Margaret's family as well - and the Tindalls who were in Australia. I think you are right we are seeing a shift to accommodate the next generation. Not only will the Queen gain more Great Grandchildren from William, Zara and Peter, but Harry, Beatrice and Eugenie are soon to partner up and create families as well. Given that the Queen is in residence until mid-February she is most likely inviting Margaret's family at another time. This gives her more quality time with everyone and spreads the festive period out a bit. Might be a more comfortable pace for her. We did not see Camilla at the luncheon and church - but can we conclude that she was not at Buckingham Palace or Sandringham? We know she honored her commitments to her charities. I'm careful to assume that just because we didn't see her doesn't mean she isn't there. She does hold an unusual place in the family - married to the heir to the throne - but not mother to royal children. She differs from Philip and Kate in that regard. Thanks for the history lesson on royal Christmases! Thank you for this post right in the middle of Christmas. How kind of you to produce it for our enjoyment! I hope you and yours are blessed with much happiness in 2015. I love Kate's outfit! I think it is perfect for the "country house" vibe of this Christmas for the Cambridges. I've loved the Betty hat since its first appearance which I believe was on visit to the Irish Guards. I also love the scarf which I think adds a lot of visual interest. It's a rich, sophisticated look. Sometimes brunettes shy away from brown because they don't want to look all brown. I think this works. Kate is very, very slender. I still don't think she looks pregnant even now. The comments about her and what she said about being big are a perfect example of how none of us can ever know how someone else feels about their appearance. The level of scrutiny she endures is the wild card because an ordinary person will never know what that feels like. I often think of how awful the press could be to Sarah, Duchess of York. It became so vicious that I think it went a long way to breaking up that marriage. Part of Diana's legacy is that whomever takes on her "position" in the younger Royal generation-young woman married to the heir or next to the heir to the throne-will undergo incredible ongoing attention and will be a fashion icon, whether they like it or not. I think Kate should be commended for how well she copes. Glad the Middletons are in the thick of things. Whatever you think of them, I think they've done a lot to help William and will do the same for Gorgeous George. Happy New Year with best wishes to all! Merry Christmas Charlotte! I hope you are enjoying the holiday. It was a treat to take a quick moment for myself at the end of a fun-filled, but super-busy Christmas day and night to see your post. I love that the Duchess wore something new. Supporting fashion that is designed and produced in Britain is exactly what she should be doing. That coat feels perfectly classic with its tweed cloth and fashion forward cut. I think she absolutely looks the part of a Duchess in the country. Well done! Most importantly, she is glowing and seems very happy. I'm sure having her close-knit family there means the world to her. How nice for George to grow up with families that are present and involved on both sides. He will benefit greatly from the emotional foundation that will give him in the years to come. I do look forward to new fashion debuts on the Duchess in 2105 and of course the new baby! So much to look forward to and enjoy. Thank you Charlotte for this gift that keeps on giving throughout the entire year. Every updated post is like a wrapped present under the tree. Blessings to you and yours for a healthy, happy, and fun New Year. What a wonderful Christmas holiday they must be enjoying at their newly decorated country estate. We'll see them next in the new year jetting off to the Caribbean for another holiday with the Middleton's. I, among others, thought her clothing looked good but rather boring. I think that might be by design though. Just being her draws the cameras enough as it is. Add to that the pregnancy and she draws a major crowd. I think when in the presence of the Queen she looks her most inconspicuous and that this is a case of trying to diverge the limelight in respect to the others. If you want a bit of nostalgia, there is a video taken at Sandringham in 1990. The occasion was the christening of Eugenie. Definitely a happier time for Andrew and Sarah. There is a brief look inside the church. It's very intimate and the acoustics are rather good. The family posing outside of Sandringham was at a happier time and fun to watch them lining up for the photographer. William and Harry are being such good boys. A number of important family members are missing from this family photo. Just seeing them together and knowing the sadness that will come in the years ahead is heartwrenching. If this doesn't work for you, go to YOU TUBE and type in Sandringham 1990.